Hypothetical Development Organization (Kickstarter Trailer) from R Walker on Vimeo. I had the pleasure to enjoy a cup of coffee with Rob Walker a few days ago here at swissmiss studio. I am a fan of Rob’s creative endeavours, thinking and writing. You might have read about his book Buying In: The Secret Dialogue Between What We Buy and Who We Are or his wonderfully poetic project called The Significant Object. During his visit Rob told me about his latest project called Hypothetical Development. Rob explained that he kept walking by a construction site that sported one of those fancy 3D renderings of what’s soon to come. After months of walking by the site, and nothing happening, it was clear that obviously this was just a bunch of hot air. The idea for The Hypothetical Development was born. 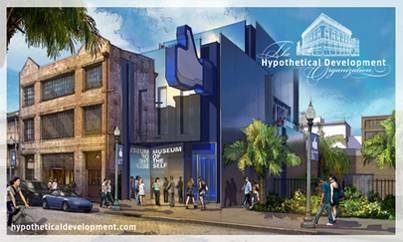 Why not pick interesting sites and come up with Hypothetical Development renderings? Consider it a new form of urban storytelling. Members of this Hypothetical Deveolpment begin the narrative process by examining city neighborhoods and commercial districts for compelling structures that appear to have fallen into disuse —“hidden gems” of the built environment. In varying states of repair, these buildings suggest only stories about the past, not the future. What this means is that they will put huge signs with illustrations/graphics of what soon is to come on this site outside various locations in New Orleans. Take the Museum of the Self as the first example. (Rendering above) I can’t help but think about how much these futuristic hypothetical developments would make me chuckle. I just backed the project with $50. It’s only $1,200 shy of meeting it’s goal. Let’s help Rob and his team make this happen. Watched the video. Sorry, I don’t get the value of the project. At. All. They wanted (and got) money to make a parody of materialistic, self-aggrandizement signage? Weird. If the purpose is to bring creativity and an optimistic view of a depressed area, then why not actually do something small but genuinely constructive instead? I agree with the above comment. I think it is actually rude to the people living near these sites to have a 3×5 poster put up of a fake future for the building. It builds false hope of a false future. The sign he walked by everyday I am sure was put up by people that really believed it was going to happen and wanted it to happen but because of bad times were unable to make that building happen. Plus the building that he makes into the thumbs up building has a million times more character then the ugly glass building he proposes. Can’t they raise money to beautify these sites instead of mocking them? Agree. So much time and effort wasted on not solving the real problem, no? I was really pretty put off by this idea, mostly because I don’t see what its really doing to help anything. I thought it may have been the fact that I am from New Orleans and may be bit defensive regarding the future of the city, but I am glad to see its not just me. I think Steve’s comments are especially relevant. What this sign would say to me if I saw it while walking down the street is “only in science fiction will this be rebuilt”. To me that’s more depressing than the buildings themselves. Now, change the context of the idea (to, say, a post on a web page or a gallery or something) and the illustrations would be very interesting and quirky / funny. However, I think that the way it is set up right now is not sending the best message. Maybe I am missing something? This is a fun test: Let me know what happens after you see all three pictures? Barry, I am not sure I understand your comment. We are speaking about what this group is presenting (one illustration and, more importantly, the concept of the project), not what they are going to present in the future. I definitely understand that being overly critical of a work in progress can be destructive on some occasions. However, since most of the critiques have been about the conceptual side of the project (something that certainly appears to be 100% completed), I don’t think it applies to this situation. This drive by artening is a tad obnoxious. It also builds up false hopes of the people who actually live in the ‘hood. About 5 years ago (or more) someone used to do this exact same thing around urban blight – make a big here’s-what’s-coming-to-this-lot big poster rendering. It was always something huge and whimsical. At least people knew it wasn’t real.